Let’s face it, moving can be expensive. The goal of all of us here at Master Movers is to try and save you money. There are several areas of your move to potentially save tons of money, however buying used moving boxes is definitely not one of them! Think about this…. Do you know who used those boxes before you? Did they smoke? DId they have shedding pets? Bed bugs? Roaches/ants/spiders? What was packed into those boxes? Was it simply clothing? Maybe garage items like chemicals? Moving boxes are only meant to be used once, they are recyclable or better yet use them to build a big fort in the living room as you unpack! After they’ve been used once, taped and retaped they are never as strong as they initially were. If you get pests inside your new home from purchasing used moving boxes, the cost of eliminating those pests will far outweigh the cost of new moving supplies. A lot of companies will rent wardrobe boxes to their customers to move clothing from one home to another, this may seem like a great idea, but now you see that it’s probably not. Some of those companies will reuse wardrobe boxes 100 times before throwing them out! 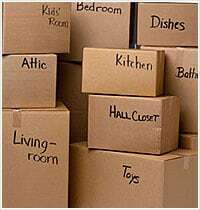 At Master Movers we will never use old boxes to move your items. So when you get ready to move, trust the experts at Master Movers to show up with New, unused moving boxes just for you. And in true green fashion, we will gladly haul off any boxes that we unpack and recycle them for you.